What happens if the first frame of the video is of poor quality? Usually the first image of the sequence is good by comparison with the others because you probably started to record the video during relatively low turbulence conditions. Otherwise, the easiest way to proceed is to replace this first image with another of better quality. Open the dialog box "Select images" on the "View" menu. 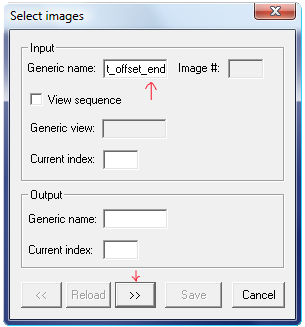 Set the generic name of the input video "bwflat_offset_end" and leave the generic name of the output sequence empty. Then click on the >> button to load the first image of the sequence. Iris automatically fills in the "Image #" and "Current index" fields. Check several images by clicking again on >>, until you find that special something. If you want to return to the previous image at any time, click on <<. Images number 1 and 20 are now the same, but it doesn't matter. What matters is that the first image in the sequence is of good quality. Iris will then select and automatically register the best frames of the sequence.